Children are born with a natural curiosity, and our Rockville Montessori preschool believes in making the most out of that creativity. As children explore and observe the world around them, they need unrestricted exploration opportunities to help them learn. Art is a natural outgrowth of this type of unrestricted exploration and the self-guided learning it creates. At Norbeck Montessori, art exploration is a key component of our overall preschool and kindergarten program. Learn more about our fine arts program! Call Norbeck Montessori at 301-924-4233. Fine motor skills – It takes even greater fine motor skills to maneuver a paintbrush than a pencil, and the more art exploration students tackle, the better their fine motor skills become. Cognitive development – Students learn important things like cause and effect and patterning when they practice with art materials. Language skills – Describing and explaining artwork helps develop critical language skills in a self-chosen manner. Positive choices – Positive choices is a key component of Montessori learning, and art gives children the chance to make many choices that create a positive outcome. Process-based learning – The goal of art instruction in Montessori is to focus on the process, not the product. Children are free to express themselves freely, with little focus on what the final product will be. Praise is on the work the child is doing, not the end result. Self-discipline – Young children must be patient and self-controlled when working with art materials, which helps reinforce the self-discipline that is at the heart of Montessori instruction. Are you interested in touring Norbeck Montessori to learn more about our school or fine arts program? Contact our Montessori school online. Art is integrated into the everyday Montessori curriculum, but Norbeck Montessori does even more through our enrichment programs. Our students have free use of real art materials. You will often see our children painting on real canvases with acrylic paints or working with modeling clay. The goal of these programs is to teach children about different aspects of art so they can explore it while also understanding it. We want to create children who truly appreciate art. 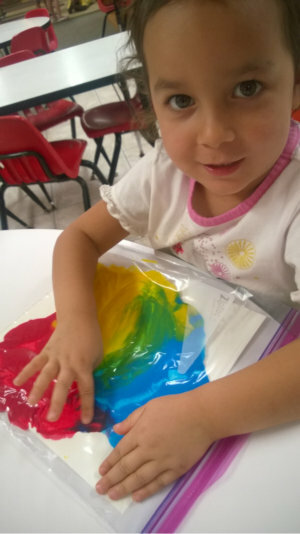 Because of our fine arts program, children are able to not only show their artwork to their families but also explain how they created them and what materials they used. Our fine arts curriculum continues to embrace the individualized instruction and self-paced learning that defines Montessori but brings into the classroom the materials and supplies necessary to experience art. The end result is a classroom of students with the freedom to explore their creative side while also learning about art mediums, artists, and artistic methods. Tour Our Montessori Preschool Near You! At Norbeck Montessori, we strive to provide a welcoming, educational environment where children can learn and thrive. Come see our preschool and kindergarten students in action and see the difference a Montessori education makes! Our Montessori school is located in Rockville with preschool and kindergarten students who come from the surrounding areas of Aspen Hill, Colesville, Gaithersburg, Glenmont, Norbeck, Olney, Shady Grove, Silver Spring, Wheaton, and the nearby areas of Montgomery County, Maryland. Schedule a tour of our Rockville preschool today or call 301-924-4233!